Life has definitely changed a lot since I was a kid. When it comes to our children, we’re a lot more safety conscious than our parents were. People in my generation actually rode bikes with no helmets and rode in cars with no air bags. We even drank water straight out of the garden hose and lived to tell about it! There’s nothing wrong with being protective of our children—my kids accuse me of being overprotective all the time. The problem comes when we start thinking happiness means being safe and comfortable and when our goal in life becomes the avoidance of all risk. When our top priority is to be safe and secure, we lose touch not just with the needs of others but with a primary need of our own. We were created for so much more than punching buttons and scrolling screens. We were created for a grand adventure! God designed us to take great risks and face huge challenges, to accomplish mighty goals that will have a lasting impact. If you discovered that you only had one month to live and you began considering how you could leave a lasting global legacy, you might be tempted to think, It’s too late. I don’t have the money or power needed to make a difference in this world. But never underestimate the power of one. It’s the ability each of us has, every day, to be used by God to bless the rest of the world. When we are reminded on the nightly newscast of global problems like world hunger, the AIDS epidemic, war, and famine, we often respond with numbing apathy or resigned defeat. Most of us are tempted to think, Why even try? The issue is so enormous and complex that I’ll never make a difference. There is a temptation to make these problems abstractions instead of daily realities for individual human lives. But if we realign our view with God’s perspective, we will do what we can do, no matter how small or inconsequential our efforts may appear. If we touch one life, we may make the difference between life and death—physical as well as spiritual��for another human being. If we make it a habit to do what we can, when we can, where we can, we will be transformed as we help others. Often we’re inspired to love others by giving of ourselves—offering what we have to help them overcome their problems and enrich their lives. We offer our bodies as living sacrifices when we give of our time, our talent, and our treasure. If you want to experience the full adventure that your life is intended to be, then you have to be willing to take action and serve those in need with God’s love. The Bible has a lot to say about caring for the needs of the poor. “If a man shuts his ears to the cry of the poor, he too will cry out and not be answered” (Proverbs 21:13). God holds us accountable for how we use our blessings to help the poor and hurting. As far as talents go, we all have talents, every single one of us. But we devise all kinds of excuses: “Well, I’m really not a Bible scholar, so I can’t teach or do missions” or “I really don’t have much money left over to support charity.” But think about what you can do. Consider the expertise you have in the jobs you’ve worked—whether it’s construction, banking, sales, medicine, or education. You have knowledge, abilities, and skills that can change the lives of others if you’ll only share them. Can you listen and care? offer a smile? hug a child? Most of us underestimate the power we have just by being present in the life of someone else. Money and how we spend it also reveal a great deal about who we are and what we value. God says it’s okay to be blessed financially as long as we do two things with our money and possessions. Number one: enjoy what we have instead of always wanting more. And number two: give generously. If we do these two things, we’ll grow in maturity and enjoy a level of satisfaction that money can never buy. 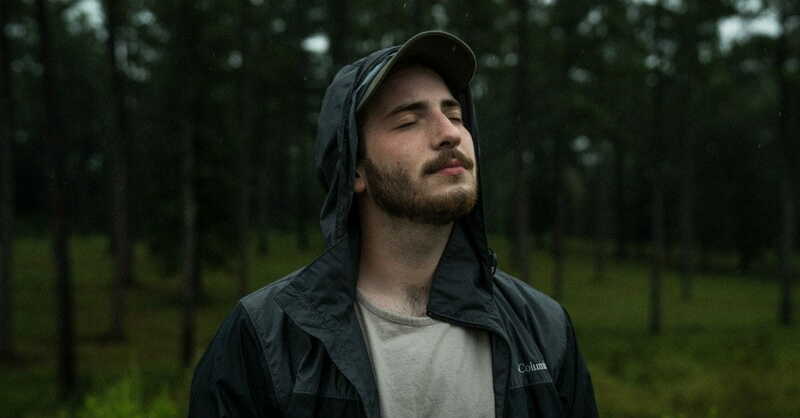 But if we hoard our blessings and take God’s goodness for granted, our hearts will harden, and we’ll never be able to reconcile with the things that matter most. The final way we grow in maturity and create a world-conscious heart is to work in community. Whether it’s through our churches, our schools, our companies, our neighborhoods, or our families, we’re called to come together to help others. “For just as you have many members in one physical body and those members differ in their functions, so we, though many in number, compose one body in Christ and are all members of one another. Through the grace of God we have different gifts” (Romans 12:4–6, Phillips). Together we can literally change the world. For the next month, choose one item of comfort, luxury, or convenience that you’ll do without. It might be your daily Starbucks, the half-hour sitcom before bed, your favorite dessert, or something similar. Use the time or money that generally goes to this item for a larger purpose—praying, contributing to world philanthropy or missions, or offering your services to someone in need. What cause, situation, or people group have you always been moved by? It might be the war- torn Middle East, people with AIDS in your own city, or missions in China, but most of us have been drawn at one time or another to a concern outside our usual orbit. This week spend some time praying for these people and researching ways you can serve them—using your time, your talents, and your treasure. Commit to a specific goal that will meet some of the needs of the people facing these issues. Needs are all around us, and we don’t have to leave our neighborhood, let alone our country, to give sacrificially. This week initiate a local service project in your area. You might work with your church, a community Web site (blog sites are great for this), or your department at work. Commit to a specific goal—for instance, making home repairs for a single mom or widow, collecting clothes for a shelter, or raising money for relief funds. Set a date, and determine the role each person in the group will play in meeting the need and getting the job done. Adapted from ONE MONTH TO LIVE: 10th ANNIVERSARY EDITION Copyright © 2018 by Kerry and Chris Shook. Published by WaterBrook, an imprint of Penguin Random House LLC. Kerry and Chris Shook founded Woodlands Church outside of Houston, Texas, in 1993. Thousands of people in more than two hundred countries tune in weekly to Pastor Kerry's televised broadcasts. 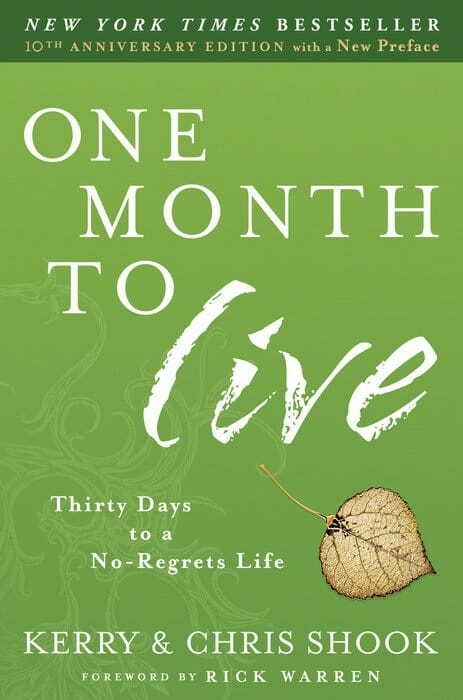 The Shooks' first book, One Month to Live, is a New York Times bestseller. Kerry and Chris have been married for more than thirty years and have four grown children.